Food and beverage products must have date codes; those without attract harsh penalties, because consumer health and safety is the intention behind them. Rather critical! Date codes give a guide to an item’s shelf-life — how long it can be kept before its quality begins to deteriorate, or it becomes potentially unsafe to consume. In Australia, it’s the manufacturer’s or food supplier’s responsibility to determine shelf life. 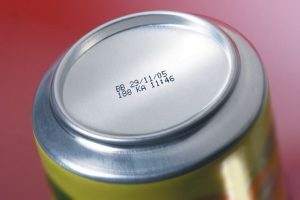 The Food Standards Code states that all packaged foods with a shelf life of less than two years must have a date mark. But retailers also benefit from using date codes. So let’s go throug h the difference between use-by and best-before dates so you know which one to use, including five essential tips for date coding. Then we’ll look at which are the best technologies to code dates. Firstly, it’s important to know that it’s not only consumers who benefit — otherwise it would just be an added cost. Retailers use date marking on secondary packaging to ensure better turnaround of your stock and reduce food wastage. Foods marked with a use-by date must be consumed before that date. If the use-by date has expired, the food may be unsafe to eat, even if it looks and smells “okay”. Foods cannot legally be sold after the use-by date because they may pose a health or safety risk, which is why retailers put such great emphasis on having clear and accurate date coding. Nutrients in the food may become unstable after the use-by date has expired or a build-up of bacteria may occur. Best-before indicates the date from which the quality of the food starts to deteriorate from its peak. Typically, foods with a best-before date are still safe to be consumed after that date and will retain their colour, taste, texture and flavour — provided they have been stored correctly and have not deteriorated beyond being fit for human consumption. As a rule, if the food looks and smells as the consumer expects, it should be safe to eat, even after the best-before date. Foods with a best-before date can still be sold after that date, again provided the food is still fit for human consumption. Foods frequently marked with best-before dates, rather than use-by dates, are those that tend to last longer, such as canned foods, frozen foods, cereals, biscuits, sauces, confectionery, dried goods, sugar, flour and so on. Foods where the best-before date is two years or more (such as canned foods); this is because it’s difficult to give an accurate guide as to how long these foods will keep, and will likely be consumed before spoiling. Foods in packages smaller than 100mm2 — unless the food should be consumed before a certain date for health or safety reasons. Individual portions of ice-cream or ice-confectionary. Bread, which can be labelled with an individual “baked on” or “baked for” date. If you’re unsure, it is always best to double check the Food Standards Code (see end of article). So what technology is best for date codes? WHICH TECHNOLOGY FOR DATECODING & BATCHCODING? There are various technologies available for date coding, and which you choose will depend on the type of packaging and your production environment. This infographic on the top 5 things to consider when you need a date coder is very handy. Continuous Inkjet Printers are a highly reliable and low-cost option for high-volume applications because they have the ability to date mark goods with fast-drying ink at speeds of up to 120,000 drops per second. They can also print variable information on most packaging surfaces, sizes and substrates (even with moisture on the surface), as well as secondary packaging (cartons and trays) — all of which makes them ideal for date coding. Thermal Transfer Overprinters produce crisp and durable codes on flexible packaging surfaces, such as film packaging, labels and gloss surfaces. This makes them ideal for date coding of snackfoods, confectionery, pharmaceutical products, smallgoods and fresh produce. Lasers are an extremely fast way to apply date codes onto both primary and secondary packaging. They can code onto glass, plastics, metal and cardboard, meaning they are a great option for liquids, water, beverages and snack foods. Because of the high-quality mark, they are particularly suited to the wine industry. Make date codes indelible. Because it’s law to have a date code in most cases, the code must be indelible and highly durable. Make date codes visible. Codes must be easily visible to the end consumer, as well as being crisp, clear and easy to read. Future-proof your business. Choose a date coder that can print on a variety of packaging materials, especially if you’re looking to launch new product lines in the future. You may find this blog on 5 codes every manufacturer must know helpful; it includes date codes, batch numbers, ID codes, barcodes and QR and other promotional codes. Need more advice on date coding your products? Speak to our experts. * Trent Munro is an accomplished business strategist, marketing innovator and speaker specialising in business development and optimisation. Over the past 15 years, he has worked across a range of blue-chip and medium enterprises including Goodyear Automotive, Clariant, Corona Manufacturing and Matthews Australasia. Trent holds a range of postgraduate and graduate qualifications in Commerce, Psychology, Project Management and Science. At Matthews Australasia, he has overseen market development locally and abroad, launching class leading traceability and automation technologies across manufacturing, healthcare and logistics.